At 33 weeks pregnant, I’m nearing the end of the 8th month of my pregnancy and it’s surreal to think I’ll be starting my last month of pregnancy in just under 3 weeks! I’ve grown so fond of my baby bump, and I think I’ve adapted really well to being heavily pregnant over the last couple of weeks. Although some days I feel absolutely ready for this baby to come and desperate to not be pregnant anymore, I’m quite happy for our little boy to stay in there, cooking for a few weeks longer and only come when he’s ready, especially seeing as we’re going away on holiday this weekend and I do not want to give birth whilst on holiday! 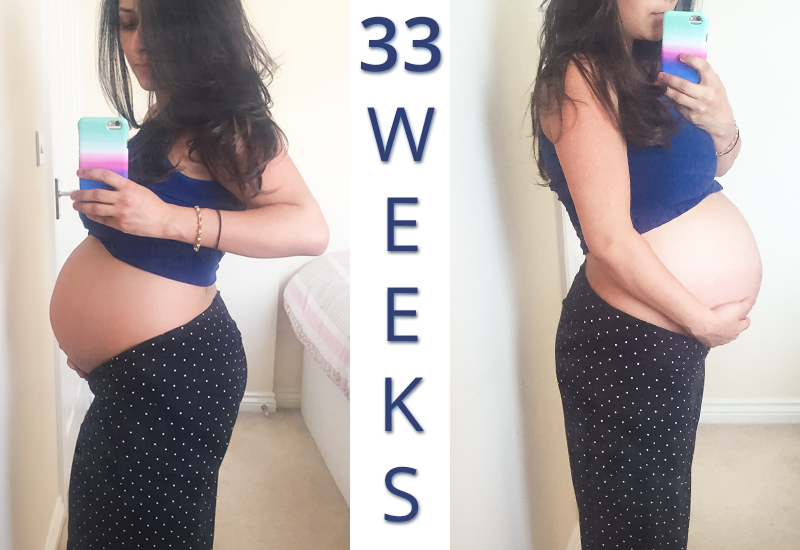 So without further ado, let’s update you on what happened during my 33rd week of pregnancy! Total weight gain: About 22lbs/ 1.6st/ 10kg – I know, crazy, right? 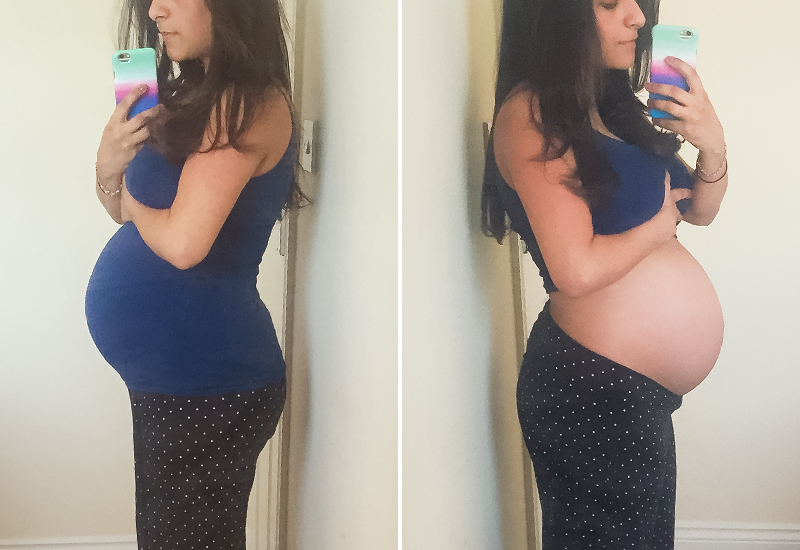 This has been the biggest challenge to me recently, and although my weight gain is healthy and on track, I have definitely avoided looking in the mirror too much, as I can’t stand seeing everything – apart from my bump – looking so plump and chubby! I know it’s superficial and possibly quite vain, but some days I feel really low when I look in the mirror and I don’t recognise my features anymore. Everything about the way I look has changed and I don’t always know how to deal with this change. All I know for sure is that I’m happy my baby continues to grow healthy and I hope he’s packing on all the pounds he needs for when the time comes! My belly is so heavy now and I’m much slower at walking or doing basic things; I also noticed he has dropped a lot this past week, which is lovely because it gives me a bit of a breather. Maternity clothes? Oh yes, plenty! I’ve done a Maternity & Baby Haul on my YouTube channel showing some of the maternity clothes I got from Asda recently. I’ve also written a blog post on my favourite picks of the New Look Maternity range, and yesterday I placed a new order on Asda for a few more Maternity basics, such as leggings and pyjamas for my hospital bag. I can’t fit comfortably in my size 8 H&M maternity jeans anymore, as they just feel a bit too claustrophobic, so my options of what to wear on the bottom half are very limited at the moment. To be honest, when I’m home, 99% of the time I’m wearing my Asda spotty pyjama bottoms, some kind of stretchy vest top from Primark and a baggy cardigan. Sleep: Pretty awful as I’m getting up about 3-4 times every night to pee, and once I’m awake heartburn hits me and I struggle to get back to sleep. I’ve just placed an order for a pregnancy and nursing pillow, which I hope will help me settle more comfortably into bed without back pain! 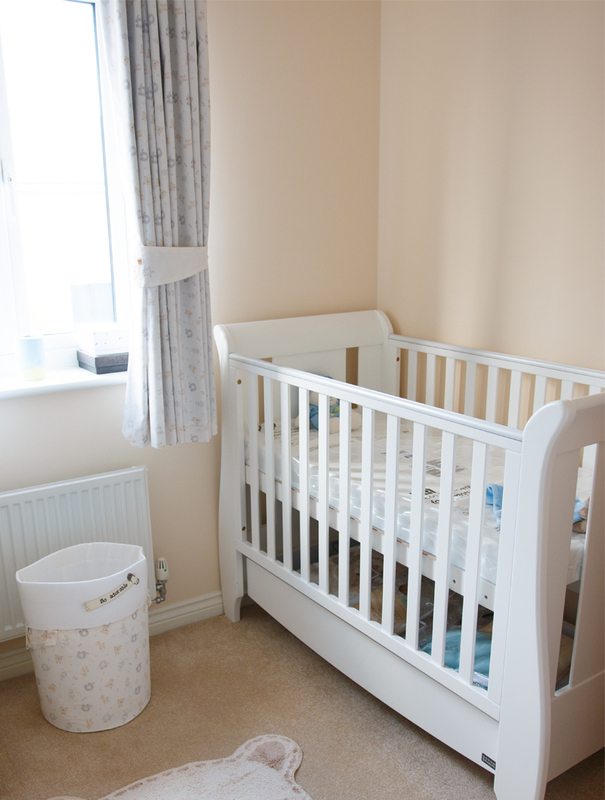 Best moment this week: Sorting through baby’s clothes in his nursery, which is now well on its way! The week before last, my husband built the cot and every day since then, we just can’t help but have a little look inside and smile thinking about how soon enough there will be a little baby in our house! Miss anything? Is it terribly wrong to say I miss having a glass of wine every once in a while? :) It’s not that miss the taste of it, I just miss being able to have it, if I feel like it. I also miss having easily manageable hair – it’s been almost a year since I last had my Brazilian Blow Dry retouched, so my hair is looking a bit wild and it takes me absolutely ages to style it the way I like. Oh, and I miss the regular size of my feet, hands and nose! Movement: Yes! I can tell he doesn’t have much room to stretch around anymore and each movement feels quite elaborate and intense! It’s almost like it’s a mission for him to rearrange his body into a different position, and I swear I can tell the difference between an elbow, a knee and a foot now. He seems to love (or hate!) music – whenever we’re listening to music, he reacts to it, especially if his daddy is playing the piano. Food cravings: No, just enjoying a prawn salad wrap for lunch every other day. I buy the wraps, the salad and some pre-cooked king prawns, then I throw it all in the oven to warm it up for a few minutes and that’s my lunch done. Sometimes I replace the prawns with pre-cooked chicken, which is equally tasty. Labour signs: No, just more intense Braxton Hicks and the fact that he’s sitting quite low at the moment. Symptoms: Swelling has been more than constant this past week on my feet, hands and face. I can no longer wear socks, boots or flats (let alone heels!) without my feet looking scarily swollen, but I’ve been reassured by my midwife that it’s just water retention and I have no signs of pre-eclampsia, thankfully. I’ve been drinking loads of water, which helps with the swelling, but it also makes me need the toilet every 5-10 minutes, so my life is currently dictated by how close I can be to a toilet. Braxton Hicks are becoming slightly more uncomfortable, if not painful sometimes, but they don’t last long and they are certainly bearable and not regular. I’m not sleeping very well with all the toilet breaks during the night and constant heartburn, but my acid reflux has died down a lot throughout the day. My skin has been quite red around my nose and I can see some pigmentation developing on my cheeks, ears and chest, which from what I’ve read is quite common, especially in people with olive or darker skin tones. Belly button in or out? On the surface, but not out yet. Happy or moody most of the time: Happy! Although I’ve had a few low self-esteem days due to letting my weight gain affect me more than it should, I have felt incredibly happy and excited to meet our baby! Looking forward to: Going away on holiday – whoop whoop! It’s making me anxious to think that I’ll have to take a hospital bag and the car seat, just in case – fingers crossed this baby stays put in there for at least another 4 weeks. You are almost there! :) I am 30 weeks today. I was wondering if you have written a birth plan yet.